Oh I see, the GOP symbol is actually a Hungry Hungry Hippo. Why does the hippo wear trousers on the plate? 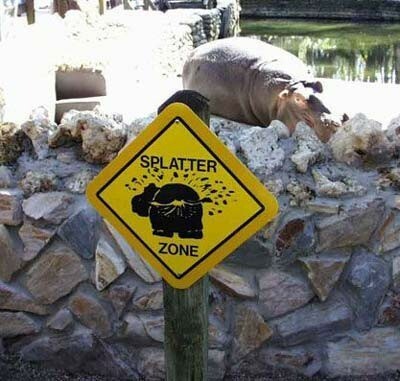 Well, I’m pretty sure that’s not a sign for hippo poop. The “trousers” Hepathos sees is actually a line showing a wagging tail as the hippo shakes off the mud in which it has been wallowing. Still, it’s a pretty funny looking sign. No, that’s exactly what it’s a sign for. Hippos wag their tails when they poop. Sends it flying everywhere. Fun times. At the zoo near Washington DC, I saw the horrible sight that is hippo poop spray. They needed this sign!